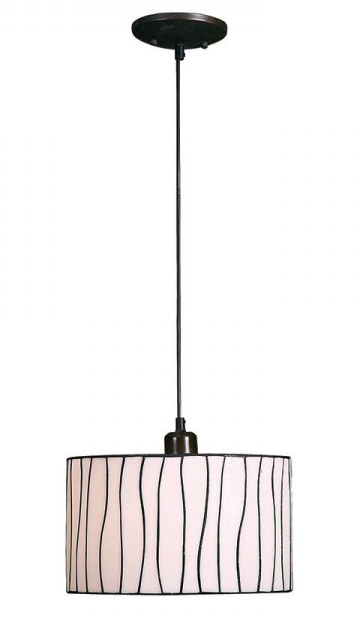 I've been on the search for new lighting ever since we moved into our new home. The current lighting is contractor grade and really has no "oomph". One of the places desperately in need of some unique lighting is my home office area. See, it needs something to make it a little extra special. I will be hanging artwork on the wall but wanted to get the lighting settled before deciding on artwork. 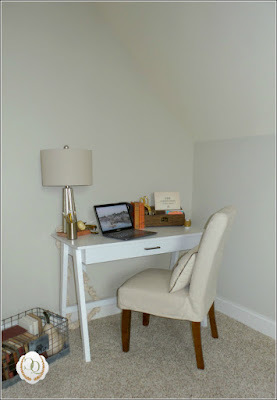 After all, I really want this corner to be nice looking until I can make it the dream space I really want. And I want to choose the right light so that it can carry over into the dream space. Since the ceiling in this area of the room is sloped, I want something hanging from the ceiling. These are some of my favorites that I found. I LOVE this light! 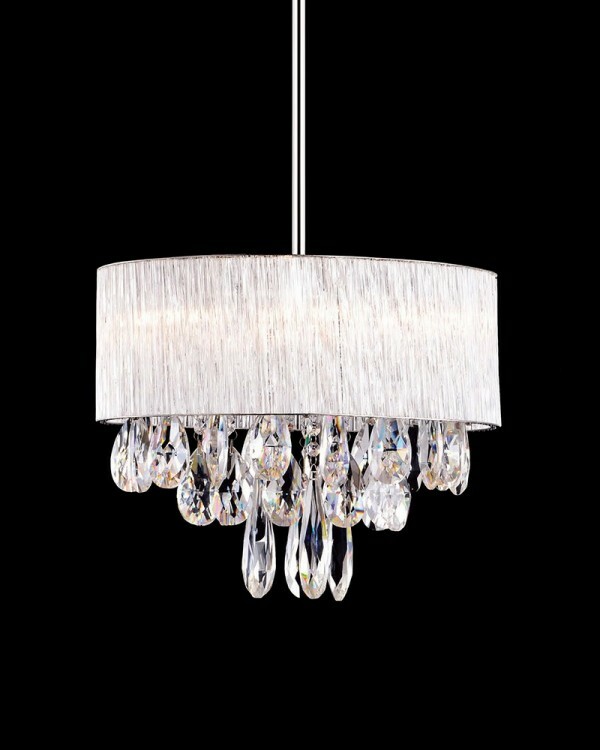 It has just the right amount of bling and isn't too large to overpower the space now or when I get new furniture. I can imagine the sparkles reflecting on the desktop while I'm working. 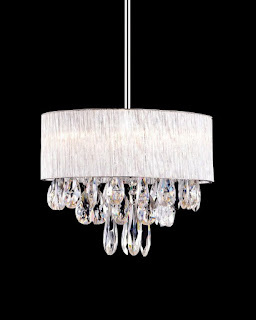 :-) And what woman doesn't love something sparkly hanging around?! I found this jewel in the pendant lighting. 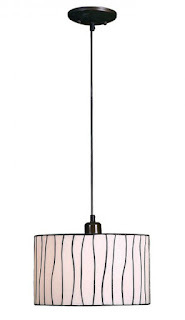 I also love this wooden light...yes, wooden! It is so unique and has a little bit of an eclectic industrial look. There are so many options in wooden lighting....it's so hard to choose just one! We had open-style lighting like this in our loft in Dallas. We received so many compliments on those lights. Then, I saw this gorgeous Tiffany light....my how these lights have changed over the years! I seem to be drawn to black or white lighting. 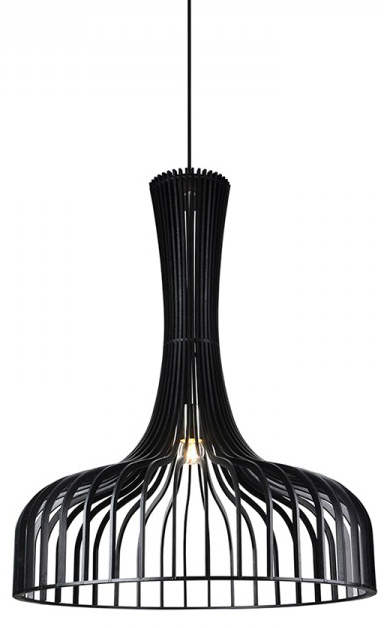 I love the clean lines of the hanging pendant and the contrasting "squigglies" on the shade. So there you have it...some of my favorites. I cannot decide what to pick because I like so many of the choices I've found. All three of these lights would work with what I have now and what I want to put here in the future. I sometimes wish there were limited choices for these things because the more options I have, the longer it takes me to make a decision! Too funny...they contacted me too but I deleted the email by mistake. Love their stuff! My vote is for that Tiffany light, but they're all beautiful. I think they are reaching out since it is the holidays…more exposure! I love the Tiffany light also….and you are right, they are all so beautiful! I know what you mean about too many choices sometimes. Since I love crystals, I'd probably choose the first one. There definitely are so many choices! What happened to the good old days when you had green, orange or yellow to choose from?! ;-) I want to order all 3 and return the 2 that I don't like...the hubster would literally have a stroke and fall out on the floor! LOL Hugs!! Thank you and I agree! :-) Hugs and Merry Christmas! I love that one too....and that is the one I'm leaning towards...I think it would be perfect over the desk! :-) Thank you so much! Love and hugs to you!! Love that crystal chandelier, so pretty! Although so many of their lights are beautiful! Their lights are gorgeous and because there are so many options, it is so difficult to decide! :-) Thank you so much girlie and holiday hugs to you!! Parrot Uncle has some super cute lighting choices!! Can't wait to see what you decide on! Parrot Uncle is great. I love the first one! Benita I tell you this as almost a confession - lol, but seriously. Lighing is my passion and weakness, so looking forward what will grace and light your home office. Now weighing in with my 2 cents the first one has bling and charm. It is one of my weaknesses also. I would have lamps and chandeliers all over the house if I could get away with it. And twinkle lights...oh, they just make everything look so pretty! Yep, the first one is wonderful and to me, would look the best! Now to just convince the hubster! ;-) Hugs!! Love the first one...crystals, how fun and elegant! !